I do know what you’re going to say, but I just wanted to make sure you were going to say it, just in case, ya know, you weren’t (but you’re going to, I just know it…). Below is the bust of the first muslin of my Cambie dress. As you can see, I haven’t got far mostly because I’m getting weird, sticky-outy bits around my underarm. I have three options to fix this (well actually, only one, but I’m trying to avoid it if I can). a) a bust dart – okay, not really an option, but I thought I would try. c) a small bust adjustment – there, I said it! So my question is, do I really have to do a SBA? I have a few tutorials lined up on how to do it because I’ve never done one before (more help is welcome if you have it though! ), but I just wanted a second (and third and fourth etc) opinion on whether that was actually what I needed to do. I think I have an irrational fear. Most commercial patterns are designed for a B cup so if you are not then you’ll have to do an SBA for an A cup or a FBA for a C, D, etc cup. It’s usually best to pick your pattern size based on your high bust measurement rather than your bust measurement and then adjust for your cup size. To measure your high bust, wrap the measuring tape around you right up under your arms catching as little of your breast tissue as you can. I think adding a side bust dart is an option. Also if you like the fit of the larger waist darts but not the bulk, you can trim out most of the body of the dart (just leave the part near the tip where it gets really small.). Don’t be afraid of the SBA! 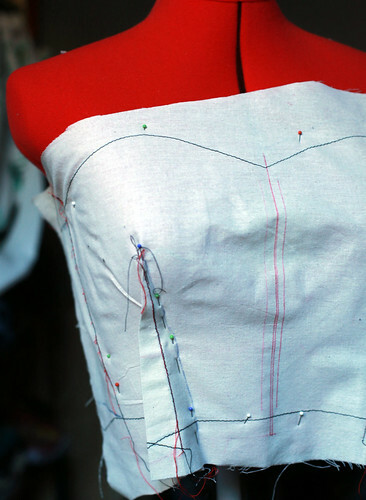 Pattern adjustments are not as scary as they sound. I have to do an FBA on all of my tops and it’s now just part of my regular sewing routine. I think the other suggestions provided are well worth trying, but as a general principle: Don’t fear the bust adjustment. I just had to do a FBA on a pattern that I decided must have been drafted by “drunken muskrats” (I’m not full-busted; I swear I never thought I’d have to do a FBA on anything, except maybe if I were using a 1970’s junior’s pattern). It’s not that bad. Be prepared to do another muslin or two to fine-tune the fit, but go ahead and do it. Besides, once you’ve done it, it’ll be easier if you ever have to do it again. I hope you will update us on what you do with your Cambie. Mine doesn’t fit quite right and I think it may be because I am small busted. Another problem was that I only did a muslin for the bodice, and when I did the actual dress, I found that the weight of the dress and it’s lining pulled the bodice down enough that my bra showed and I didn’t know how to fix it. But I love the dress so much that I am going to attempt it again, possibly with a full bust adjustment. Urk!!! I meant SMALL bust adjustment. Hmmm.. this seams strange to me… if you need to enlarge your dart isn’t it rather an FBA, not an SBA? it seems to me but maybe im wrong that you could just take that little bust dart you created and flatten it out, i mean just laying it flat and then tracing the pattern without that bit. it seems like its too long in the bust are, giving you too much length there. darts create curves and if you don’t need those, your darts should get smaller, not larger. you see what i mean?! but maybe that doesn’t make any sense. i’d definitely go with the other Stephanies 🙂 suggestion above that you should check you upper bust measurement to see if you have chosen the right pattern. i don’t know if this was helpful, sorry if this is confusing. good luck on you cambie! That was what I was thinking! I am certainly not a fitting expert, but my understanding was that the need for a deeper dart indicates that there needs to be more room in the curve of the bust. It looks like what she’s trying to accomplish is to take out fullness around the bust that’s causing gaping near the underarm/sideseam area. I don’t think the deeper waist dart is necessarily the answer. That will also take in the waist, so if you don’t have excess room in the waist to remove, avoid the deeper waist dart. I think adding the bust dart is a good strategy if you want to avoid the SBA–but really, once you’ve done one bust adjustment, you’ll wonder why you never did them before. The fit can be so much more precise and you won’t feel like you’ve jerry-rigged your garment to get a good fit. Plus, you won’t have changed the design lines. I like your blog so I’m now following you! Thanks so much for your comments everyone 🙂 Maybe I am confusing an SBA – I thought it was to take out fullness (what I have) and an FBA adds fullness? So therefore I would do an SBA? The bust dart – I guess I don’t really want to do a bust dart due to it ruining the line of the bust. In a busy fabric this would be fine, but in a plain fabric I, personally, think it wouldn’t look great as it wasn’t designed to have a bust dart. 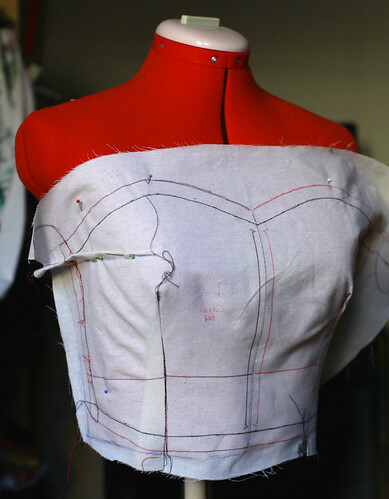 If you are choosing a pattern based on your full bust measurement, they’ll be enough space in the bust but it’ll be loose elsewhere like the back and neckline. I’ve also found that I get weird underarm gaping if I start with my full bust size rather than my high bust size. The opposite should be true if you need an SBA (fits in the bust but tight elsewhere). Can you slash & pivot the pattern to loose the side bust dart? That’s what I would try. Also re a large waist dart, cut a section of the dart out leaving normal seam allowance & 1cm from the point, then press it flat. You should only need to finish the edges or use pinking shears if the fabric has a tendency to fray or you are not lining the bodice. The larger waist dart works well, and you can trim it down like a normal seam allowance once it’s sewn in, you don’t have to leave the whole fold of fabric in the garment 🙂 It is better than the bust dart idea because it doesn’t alter the top line of the bodice as much. Also, almost every single bodice of this shape on the planet will gape a little on the sides without some kind of taping to ease it in and stabilise it. It’s because the top edge is on the bias at a point where you want it to be snuggling in, not flaring out. Cotton tape eased into the seam will help. Have you cut the right size? Seems like you have lots of room there, perhaps going down a size would reduce the amount you need to adjust.